Win Rs. 250,000 From the Dettol Warrior Education Fund For Your Child Germoon has attacked again…will Dettol Warriors be able to defeat him? 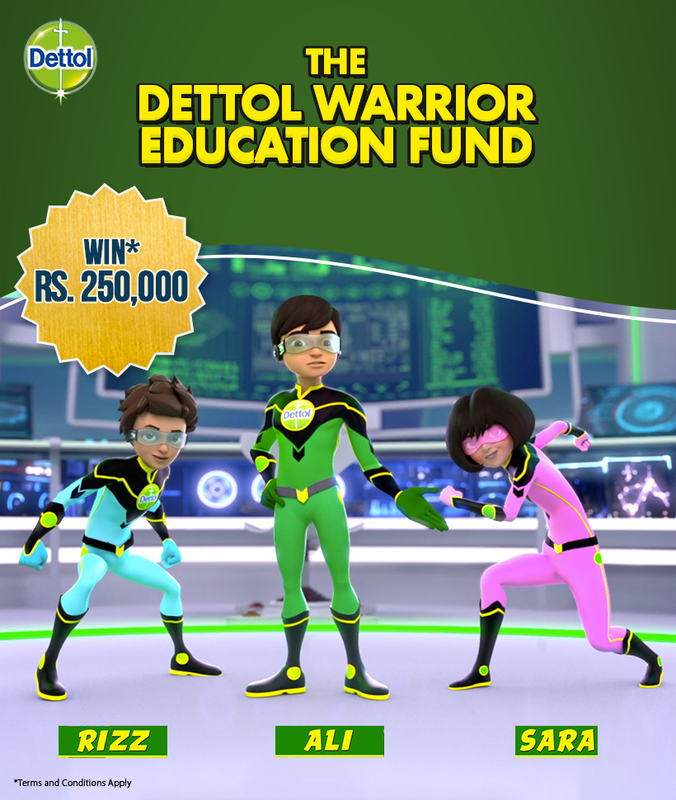 Dettol, the household name for hygiene, brings an exciting opportunity for your child to win the Dettol Warrior Education Fund worth PKR. 250,000. This announcement was made through a new campaign launched recently where the Dettol Warriors are seen calling out to their fellow warriors for support to defeat ‘Germoon’. Step 3: Vote for your favorite idea through a SMS (details will be given in the recorded call). Humayun Farooq, Director Marketing - Health, Reckitt Benckiser (RB) Pakistan, makers of Dettol, said, “Dettol Warriors are on a mission to create awareness in children regarding hygiene which in turn will protect children across Pakistan from germs that make them ill during the school year. This special Dettol Warrior Education Fund is to excite children so they can associate with their favorite character and ensure healthy and hygienic practices for themselves and those around them. We at RB are committed towards a healthier and cleaner Pakistan promoting positive behaviour change to the masses under the bigger umbrella of our initiative 'Hoga Saaf Pakistan'." The idea with the highest number of votes will become part of the next Dettol Warriors episode, and one lucky winner will win the Dettol Warrior Education Fund worth PKR. 250,000 as per the terms and conditions of the campaign. Dettol has been a widely trusted brand by mothers for germ protection and instilling good hygiene habits to promote health and wellness for over 80 years. RB (formerly called Reckitt & Coleman) is the world’s leading consumer health and hygiene company. The company has operations in over 60 countries, with headquarters in the UK and sales in almost 200 countries. RB Pakistan began operations in the late '50s. The Company invested $23 million in 2013 and continues to further invest in areas including manufacturing, factory expansion, education programmes, and communication along with consumer coordination. According to Fahad Ashraf, CEO RB Pakistan, Pakistan still has enormous uncharted potential to make the business environment more conducive and at par with the international quality standards. We will continue to explore favourable opportunities to invest in the growth of our business in Pakistan.